Widely acknowledged as Design Icons in their own right, Tripp Trapp (and Sleepi) have been long-term residents of the London V&A Museum of Childhood, both displayed as important, historical design pieces in the permanent collection. Debuting over Easter weekend, Tripp Trapp also appears in the new and eagerly awaited exhibition: Century of the Child: Nordic Design for Children 1900 to Today. Borrowing its title from the groundbreaking 1900 book, The Century of the Child, author Ellen Key foretold that during the 20th century, children would go from being 'seen and not heard' to the very heart of every parent's world. Her ideas on encouraging creativity, education and the rights of children run right through Nordic design and have shaped the content in this essential new exhibition. Nordic designs are now found in homes and playgrounds across the UK. From Brio and Lego to Stokke's much loved Tripp Trapp chair. Nordic products are everywhere. The far-reaching success of Nordic children's products can be attributed to their innovative and intuitive designs, where the needs of the child are central. Nordic Values - A look at the distinct and unifying influences that worked together to help forge progressive Nordic design. Design for Living - With the advent of new, modern housing children were given their own dedicated spaces that were crying out to be filled with child-friendly designs. Designers responded with child-centric designs that sat seamlessly within the modern home. Eco-Innovations – The synergic relationship between Nordic designers and the natural world is explored via a showcase of how innovative designs for children can be created using environmentally sustainable materials while being beautiful, practical and enduring through generations of use. As an iconic, sustainably produced Nordic design, Tripp Trapp, for many people epitomises Scandinavian design. For a product that launched in 1972, its design and relevance to children and parents is as important now as it was over forty years ago. 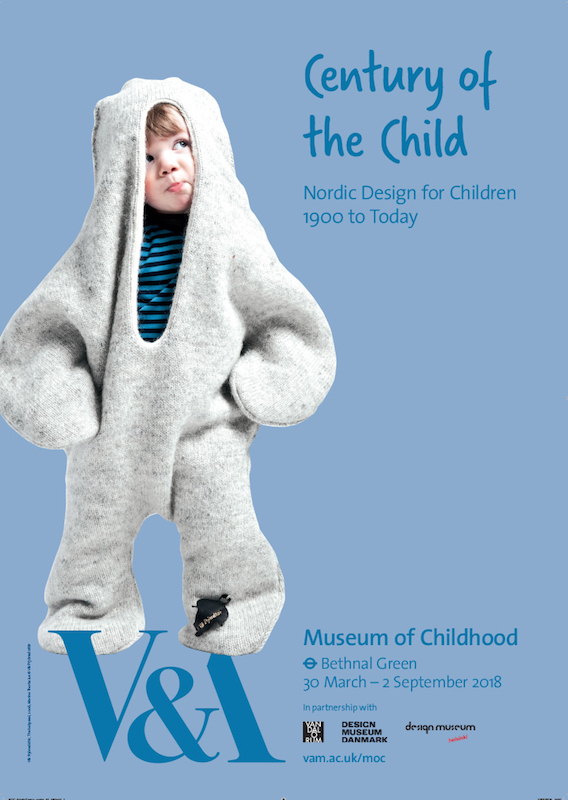 The Century of the Child: Nordic Design for Children 1900 to Today runs until 2nd September 2018 at the V&A Museum of Childhood, Cambridge Heath Road, London E2 9PA (nearest tube is Bethnal Green). Admission is free. If you visit the exhibition, please do share any Tripp Trapp pics that you take. With your permission, they will be featured here and on our Instagram page.